Make the most beautiful road trips through Europe with this comfortable motor coach equipped with all comforts. 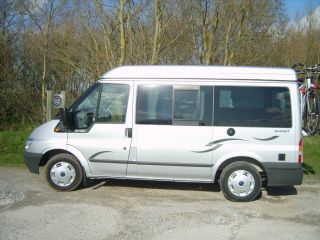 You travel easily from place to place, and in an instant you ready state in a motorhome / camping. Also ideal for a city break and in many countries it is allowed in the city park, for example, a market or a stadium. The motorhome has a bike rack for two cycled. - Camper with 4 beds (2 adults + 2 children). - Powerful TDI diesel engine. 120 km max. - 2 burner stove with sink (including full gas bottle). - Two pilot seats. So you can with 4 people to sit inside the table. - Full kitchen inventory. (No bedding). - Fire extinguisher / kit. - Bike carrier for two bikes. - Two chairs and one table for outdoors. Smoking and pets are not allowed. Or in concert. The motor coach will clean and supplied with a full tank. I expect the bus as also to receive back. Response from Mark Thank you jennifer! !